Are There Predictable Crop Price Cycles? The downturn in crop prices that began in mid- to late-2014 and continues today has led to declining farm income and downward pressure on farmland values and rents. The financial condition of many farms has worsened as a result. In this environment, there is an understandable interest in the subject of when crop prices might recover (e.g., farmdoc daily, September 3, 2015; March 11, 2016). This naturally leads to the question of whether there are predictable crop price cycles in the long-run. Many attempts in price analysis rely on an intuitive, and relatively simple, causal chain exemplifying the relationship between price and quantity in crop markets. High prices create the impetus for more production, which in turn, leads to more acreage. This acreage expansion creates a larger quantity supplied to the market which results in lower prices. These lower prices result in less acreage planted for production and eventually will result in prices moving higher. This process then repeats over time in a classical cobweb framework (Tomek and Kaiser, 2014, Ch. 9). This intuitive explanation of crop market dynamics presents an argument for a cyclical, and therefore somewhat predictable, pattern of price formation over time. While intuitively appealing, this cyclical framework for thinking about long-run price determination requires careful examination, which is the purpose of this article. We recognize the market environments between eras vary substantially. In particular, Federal commodity policy changed substantially over the decades and these policies may have impacted price behavior. Regardless, we see the characteristics of historical price patterns within each era, as well as the underlying dynamics of price determination, as containing useful information in forming expectations for the average price as the new era of prices continues. To evaluate the prospects for average corn prices in the current era requires an identification of the factors that launched the transition to the previous era that began in 1973. Those factors included changing exchange rate policies, escalating energy and price inflation, and large grain purchases by the former Soviet Union. The entire period witnessed expanding export markets and continuous consumption growth through 2006. Simultaneously, production increased at a similar rate creating a stable supply and demand relationship interrupted by infrequent events. One can think of the stable fundamental relationship over the entire era as the average price of corn during the period. The average price of corn in the era was $2.42 per bushel. Supply concerns related to drought and larger issues related to the economy exemplify the type of infrequent events moving prices. The early freeze of 1974 and the drought years 1983, 1988, and 1995, in particular, are reflected in price jumps during the era and are associated with extended periods of above average prices that eventually return to the mean. The period of large U.S. corn crops from 1998 through 2002 is associated with an extended period of below average prices that eventually returned to the mean. It is straightforward to observe the end of the second era and the beginning of the current price era in corn. The change in policy related to the Renewable Fuels Standard beginning in 2005 created a major increase in demand for corn for ethanol production that resulted in substantially higher average prices beginning in late 2006. In assessing the likely average corn price in the current era, Irwin and Good (2008) considered the 89 percent increase in the average monthly price from the first era extending from 1947 through 1972 to the second era extending from 1973 through 2006. A similar change in the new era pointed to an average price of $4.60 per bushel. Through April 2017, the monthly average price of corn in Illinois in the current era is $4.57 per bushel, exceedingly close to the projection. Similar to that of the previous era, prices have also been extremely volatile in the current era, ranging from a low of $3.00 in the first month of the new era to a high of $7.58 in August 2012. The price volatility reflects a range of supply and demand conditions that included the financial crisis of 2008, shifts in U.S. and world corn acreage, severe drought in the U.S and South America in 2012, four consecutive years of very large crops in the U.S from 2013 through 2016, and generally sluggish economic growth for much of the past 10 years. While the available price data is helpful for identifying the average price in the new era, the deviations and reversions to the average price do not occur in a predictable cycle in terms of either magnitude of deviations or duration of deviations. 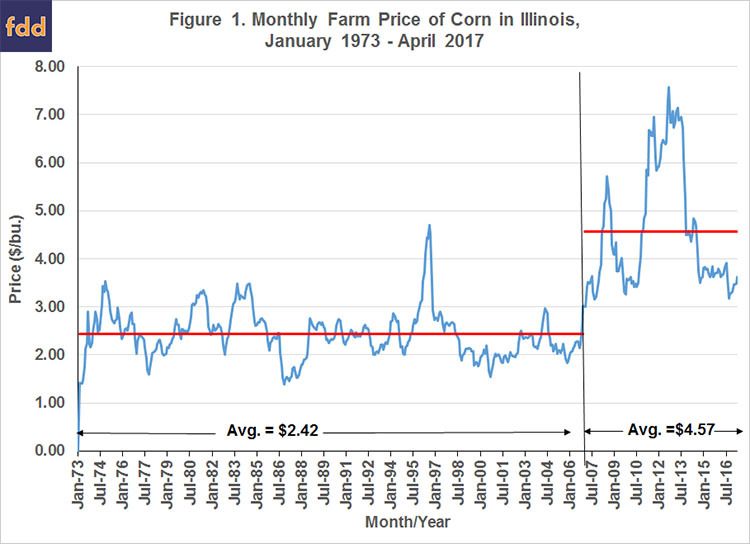 For example, in Figure 1 it is difficult to deduce any distinct cyclical pattern in corn prices during the 33-year era between 1973 and 2006. 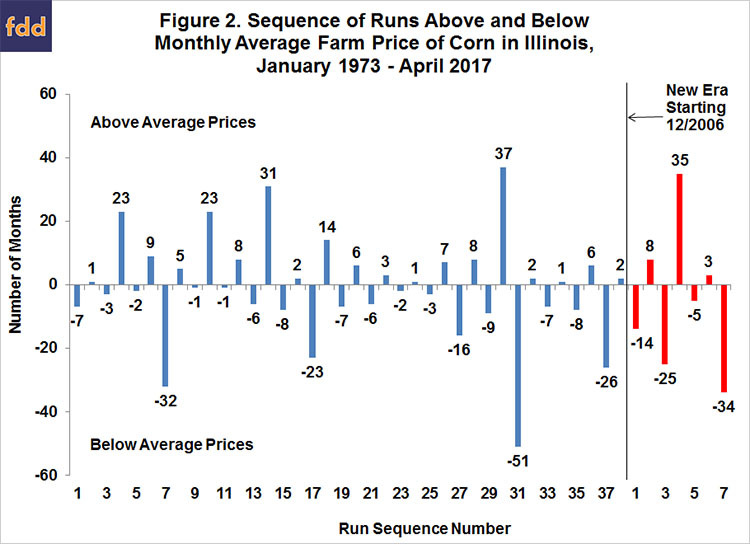 That point is further demonstrated in Figure 2, which depicts the sequence of “runs” of monthly average Illinois corn prices above and below average prices over January 1973 through April 2017. The zero line is the equivalent of the average price in the two price eras. The runs of consecutive months of prices below average in the previous era ranged from one to 51 months while the runs of consecutive months of prices above average ranged from one to 37 months. The magnitudes of deviation from the average are not shown, but the magnitude of negative price deviations in the previous era ranged from $0.01 to $1.03 and the magnitude of positive deviations ranged from $0.01 to $2.28. The sequence of runs of consecutive months of prices below average in the new era ranged from five to 34 months while the runs of consecutive months of prices above average ranged from three to 35 months. The magnitude of negative price deviations ranged from $0.01 to $2.57 and the magnitude of positive deviations ranged from $0.01 to $3.01. Overall, the sequence of runs in the new era is fully consistent with the experience of the previous era. Further proof of the unpredictability of the duration of runs above and below average prices is found in Figure 3. Since a positive run, by definition, must be followed by a negative run, and vice versa, the absolute value of the length of negative runs is used here. Simply put, there is no relationship between the duration of the current run and the previous run. Long runs above average are not necessarily followed by long-runs below average, and likewise, short runs below average are not followed by short runs above average. This shows that the length of sequences above and below average prices is random. This is strong evidence against the view that long-run crop prices cycle in a predictable manner. 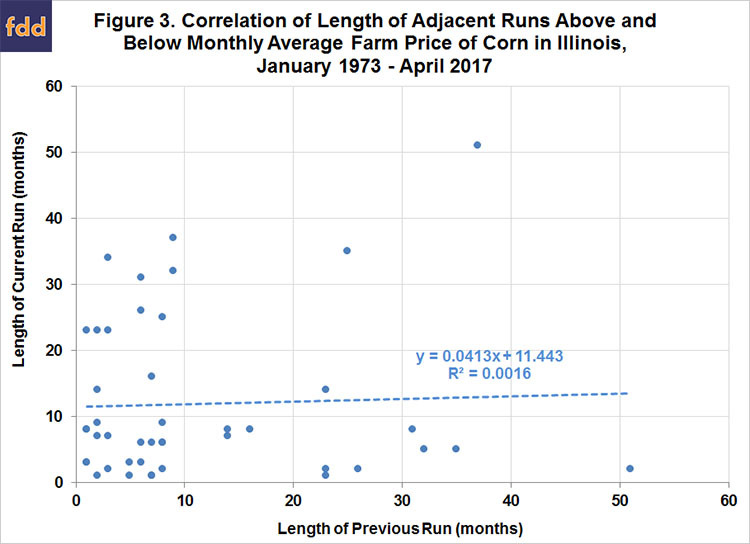 We can summarize our findings to this point as follows: (1) there is a long-run average nominal price of corn for different eras that tends to emerge fairly early in each era; (2) corn prices revert to the average within each era; and (3) the deviations and reversions to the average price do not occur in a predictable cycle in terms of either magnitude of deviations or duration of the deviations. In other words, we argue that long-run crop prices have a stable average within a defined era and adjust to supply and demand shocks in a classic cobweb fashion. However, the price adjustments do not follow the repetitive cyclical pattern of the classical cobweb model, but rather, are highly volatile and difficult to forecast due to the substantial variation in supply and demand shocks over time and the exact market reaction to those shocks. So, where does this leave producers with regard to crop marketing? While price fluctuations around the average price are indeed very difficult to predict from month-to-month, the longer-run mean reversion tendency of prices provides some useful guidelines for producer marketing. Specifically, mean reversion implies that producers should minimize sales when prices are significantly below the long-run equilibrium price and sell more aggressively when prices are well above the equilibrium price. For example, in the farmdoc daily article of February 28, 2013 we recommended a rule-of-thumb of not marketing heavily below a monthly average price of $3.75 per bushel but marketing aggressively above $5.25. The challenges to that strategy, however, are significant. First, the average, or equilibrium price for any era, including the current era, is not known with certainty until the era is over. Second, the magnitude and duration of prices above or below the expected equilibrium price are not known, which is why this is only a rule-of-thumb rather than a highly precise timing signal for marketing. The monthly average corn price in Illinois has been $4.57 per bushel since December 2006, but the price was below that average for 34 consecutive months ending in April 2017. The immediate question, then, is the expectation for an average price near $4.60 for the current era too high? If so, what is a more realistic expectation? There is still some uncertainty in forecasting the average corn price during the current era even though the era is in its eleventh year. The difficulty stems from the inability to forecast production responses, demand strength, and the frequency and magnitude of supply and demand shocks. While it is not possible to forecast the duration of the current era of corn prices or the average price for the era with great precision, we continue to believe that the long-term equilibrium price is well-above the average of $3.64 experienced over the past 34 months. Combined with our view that corn prices are mean-reverting in the long-run, this suggests more favorable marketing opportunities for corn will occur at some point in the not too distant future. The long run behavior of corn prices suggests that there is an equilibrium price that represents the fundamental intersection between supply and demand. That equilibrium is represented by the average nominal price. A fundamental shift in demand occurred in 2006 that has resulted in a higher average nominal price than occurred in the previous era. Within an era, corn prices moved above and below the long run equilibrium price by varying magnitudes with varying durations based on the supply and demand scenarios specific to each crop year. Over time, prices tended to revert back to the average price. The critical point, however, is that those deviations and reversions do not occur in a smooth, predictable cycle that is useful for forecasting price movements. History suggests that corn prices will eventually move up to and above the long- term average that may be in the low- to -mid $4.00 range. History also suggests that the reversion from lower to higher prices will not occur in a predictable pattern. The timing of the reversion depends on the occurrence of a supply or demand shock or continued supply adjustments over time. Prices admittedly face some head winds in the near term in the form of a mature ethanol market and slow economic growth both domestically and internationally. When prices do move back to and above the average price, the challenge for corn producers will be to judge the magnitude of the potential price increase and time pricing decisions accordingly. Given the extended current period of low prices, there may be a risk of under-estimating the potential magnitude of higher prices. The recent period extended period of low corn prices is associated, at least in part, with four consecutive years of generally favorable weather and large crops in the U.S. Next week, we will examine the role of weather and weather shocks in the pattern of corn prices over time. Irwin, S., and D. Good. "The New Era of Corn and Soybean Prices Is Still Alive and Kicking." farmdoc daily (6):78, Department of Agricultural and Consumer Economics, University of Illinois at Urbana-Champaign, April 22, 2016. Irwin, S., and D. Good. "How Long Should We Expect Corn and Soybean Prices to Remain Above or Below Average?" farmdoc daily (3):213, Department of Agricultural and Consumer Economics, University of Illinois at Urbana-Champaign, November 7, 2013. Irwin, S., and D. Good. "New Era Crop Price Distributions and Marketing the 2012 and 2013 Crops." farmdoc daily (3):39, Department of Agricultural and Consumer Economics, University of Illinois at Urbana-Champaign, February 28, 2013. Irwin, S., and D. Good. "The New Era of Crop Prices--A Five-Year Review." farmdoc daily (3):38, Department of Agricultural and Consumer Economics, University of Illinois at Urbana-Champaign, February 27, 2013. Irwin, S., and D. Good. "A New Era in Real Agricultural Prices?" farmdoc daily (1):45, Department of Agricultural and Consumer Economics, University of Illinois at Urbana-Champaign, April 19, 2011. Irwin, S., and D. Good. "Livestock/Corn Price Ratios in the New Era." farmdoc daily (1):40, Department of Agricultural and Consumer Economics, University of Illinois at Urbana-Champaign, April 12, 2011. Irwin, S., and D. Good. "A New Era in Crop Prices?" farmdoc daily (1):27, Department of Agricultural and Consumer Economics, University of Illinois at Urbana-Champaign, March 29, 2011. Irwin, S., and D. Good. "The New Era of Corn, Soybean, and Wheat Prices." MOBR 08-04, Department of Agricultural and Consumer Economics, University of Illinois at Urbana-Champaign, September 2, 2008. Irwin, S.H., and D.L. Good. "Market Instability in a New Era of Corn, Soybean, and Wheat Prices." Choices 1st Quarter 2009, 24(1). Accessed April 6, 2016. http://www.choicesmagazine.org/UserFiles/file/article_56.pdf. Peterson, P. "How Long Will It Take until Corn Prices Recover?" farmdoc daily (5):162, Department of Agricultural and Consumer Economics, University of Illinois at Urbana-Champaign, September 3, 2015. Tomek, W.G., and H.M. Kaiser. Agricultural Product Prices, Fifth Edition. Cornell University Press: Ithaca, NY, 2014. Zulauf, C. "Examining Factors Affecting Long Term Corn and Soybean Prices." farmdoc daily (6):48, Department of Agricultural and Consumer Economics, University of Illinois at Urbana-Champaign, March 11, 2016. Spanning the Globe – Corn, Soybean, and Wheat Production and Exports since 2000: Focus on the Black Sea Area and the U.S.